Backwards Beekeepers: How to feed your bees. How to feed your bees. In Backwards Beekeeping we don't use any chemical treatments on our bees, but during lean times and when starting a new hive, the bees need food. We feed the bees a simple solution of cane sugar and water, mixed up in a plastic zip-lock baggie. Fill one-third of the baggie with white sugar, then about an equal amount of water. Zip the bag and mix it gently until the sugar dissolves. 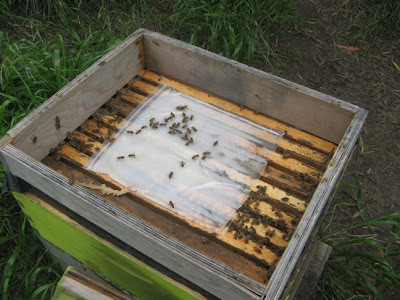 Put a 4" shim (see photos below) on top of your hive, and place the sugar bag directly on the hive frames. Give the bag a moment to settle, and then gently cut a slit halfway across the top of the bag. This slit allows the sugar water to seep out so the bees can collect it. Put the hive cover over the shim, and you're done. Your bees will quickly discover the sugar, and within a week or so the bag will be empty. 1. Make sure your hive is nearly level! 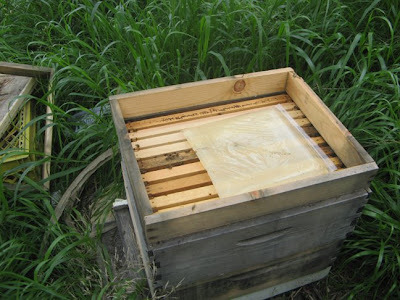 A slight downward tilt of the hive helps water to run out during heavy rains, but just a little tilt goes a long way. 2. Don't use brown sugar, as it can sicken the bees. Also avoid sugar made from sugar beets, as these beets are routinely treated with Roundup and other chemicals. Corn syrup isn't a good idea either. Spring comes to Eagle Rock. The Backwards Beekeepers have a posse. How they used to keep bees.